There are plenty of entry-premium luxury cars out there claiming to have the brawn to go ten rounds with their sporty competition, but how many of them actually have the mettle (and metal) to back it up? Not as many as you would think. The idea of trying to combine a luxury car with a lithe fighting stance you’d expect out of a sports car is problematic on just about every level. Something just has to give. Do you go for the stiff, planted ride of the sports car at the cost of comfort, or go the opposite way and suffer in the corners? Do you hear every last dripping horsepower under the hood or mute them in exchange for a quiet cabin? That’s the task Mercedes-Benz’s engineers tackled with the C63 AMG. With an impressive 6.3-liter V-8 out front and a suspension to bear the grunt, this car puts its predecessor to shame. And they’ve still managed to make the car usable as a daily driver, with a slow-shifting comfort mode, plush seats and tech features galore. Is this luxury with a razor’s edge? Oh yes. Yes it is. Nearly everything. The V-8’s noise is perfection and the bolstered leather seats hug every bit of you. 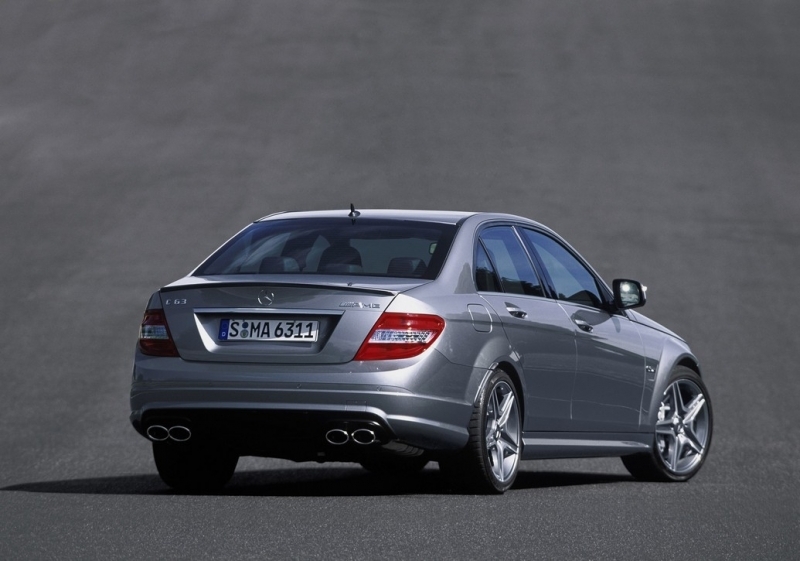 The suspension is well suited to the power output and curb weight of the C63. And surprisingly, it’s a versatile car with room for four tagalongs and plenty of storage space. The Comand controller seems superfluous with the limited tech options on this car. We’re not fans of the small screen and its odd cover. Steering, while clinically precise, lacks an emotional quotient. And for all you tech junkies, this car’s system isn’t iPhone compatible, yet. 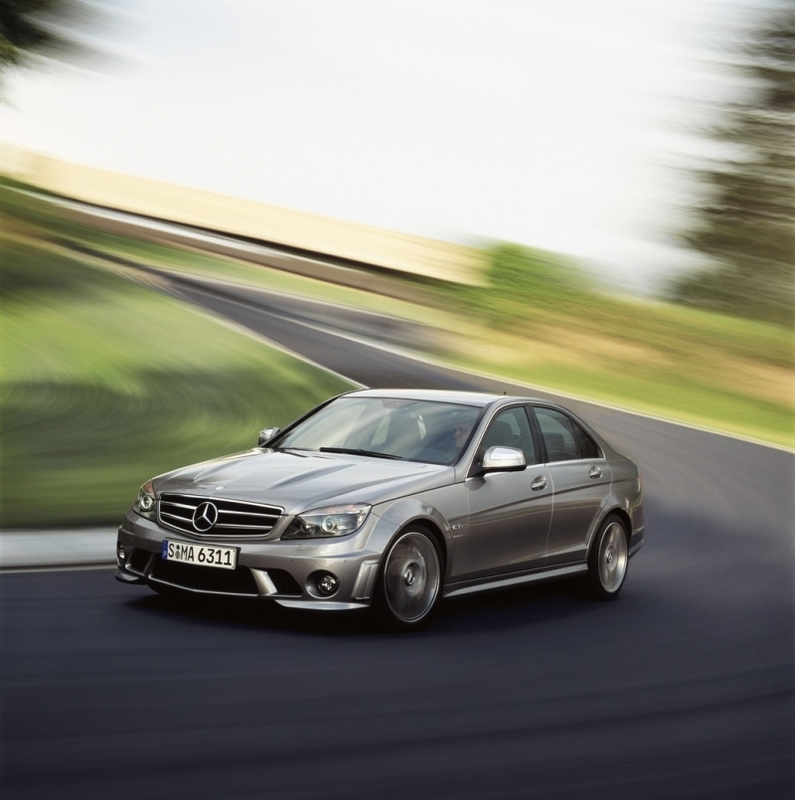 From the get go, the C63 AMG conveys a singular purpose – to make and maintain speed. And it seemingly does it with minimal effort. The V-8 roars to life and brings the heavy sedan up to serious speeds in no time, hitting 60 mph in a claimed 4.3 seconds. The seven-speed automatic transmission blips through gears faster than Ken Block on a closed rally course, but you can always take complete control and use the manual mode with paddle shifters. That’s making speed done, but what about maintaining it? Here’s where the brilliant suspension comes into play. It’s stiff but handles bumps with ease, keeping the C63 grounded over all road conditions. Steering is clinically precise, a little emotionally disconnected, but dead-on direct. And when it comes time to bring all 3,649 pounds of this car to a stop, the massive disc brakes perform the job handily. While it’s difficult to pick a bright spot on this car, the 6.3-liter V-8 under the sculpted hood makes a good case for itself. The engine produces 451 horsepower and 443 lb-ft of torque. That’s a full 37 more ponies than the vicious BMW M3. 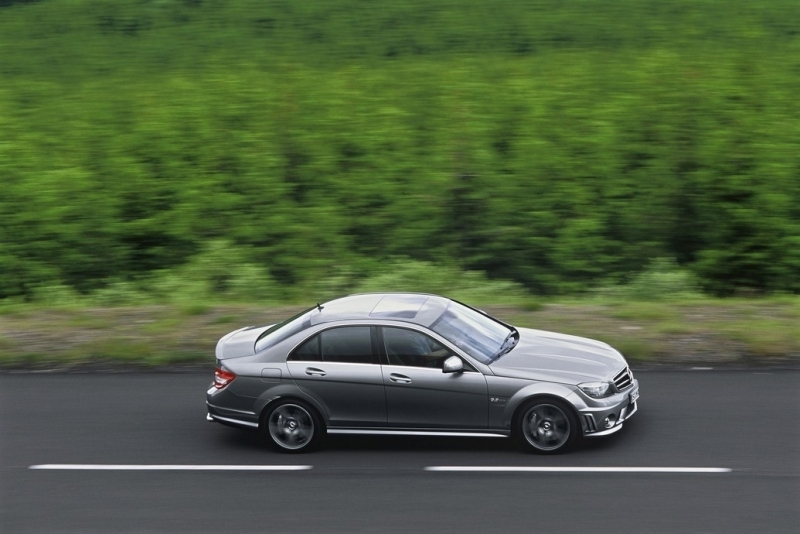 The C63 AMG is equipped with a seven-speed Speedshift automatic transmission that puts power to the rear wheels. Mercedes-Benz offers a number of packages for the C63 AMG, including a seating package with memory seats for both the driver and passenger. For the more performance minded, we highly recommend the AMG Performance Package, complete with a limited-slip differential, special braking system and track-calibrated suspension. The Performance Package will raise the car’s top speed from 155 mph to 174 but will also add to the bottom line. This Mercedes-Benz is available with a Multimedia Package that includes everything from voice control for your hands-free calling and audio to a Harman/Kardon 5.1 digital surround-sound stereo. A new iPod interface has been added this year that allows for easy music navigation. Other goodies include a six-gig hard drive, a seven-inch color display for the C63’s navigation system and new parking aids, including a rear-view camera option and tilting side mirrors. Though the C63 AMG isn’t going to be winning any fuel economy awards any time soon, its numbers are more than respectable given the amount of power on tap. This serious sedan serves up 12 mpg city, 19 mpg highway. The cabin is a pleasure to occupy, no matter where you’re sitting. Both the driver and front passenger are treated to comfortable sport leather bucket seats with adjustable bolsters to keep you planted. The back seat isn’t exactly cavernous, but it’s big enough to comfortably transport two extra passengers. The C63 AMG’s looks aren’t for everyone. The front fascia serves up plenty of abrupt, sharp angles that seem to reach for a purposeful, aggressive look, but manage to come off a little too tuner – not the look most $60,000 cars tend to go for. 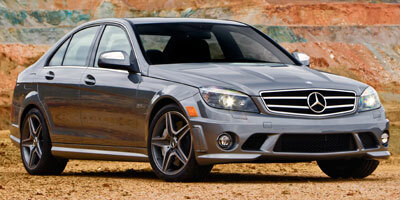 With a starting price of $57,350, the cost of the C63 AMG will continue to rise as you add the tempting packages. That puts it in line with other sport sedans like the BMW M3 Sedan at $54,000, the Lexus IS-F at $58,460 and the Cadillac CTS-V at $62,020. With more than enough power and a near faultless performance, it’s evident that the C63 AMG is a proficient machine. Yet the interior provides enough warmth and luxury to keep daily driving a reality. It’s not perfect, as is exemplified by some of the styling cues, but it has all the right elements to go toe to toe with the legendary M3 and its newer competition.